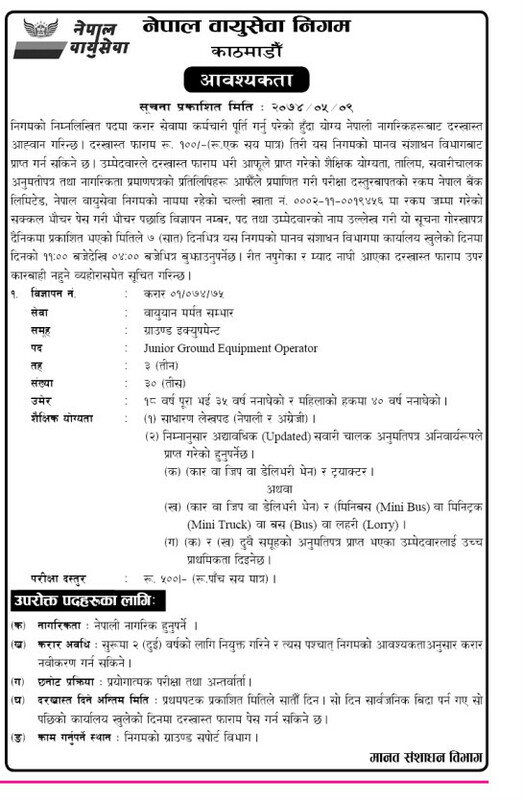 Royal Nepal Airlines Corporation Vacancy has already been published and it is hiring 30 number of Junior Ground Equipment Operator. Only the Nepalese citizens who have reached 18 years and not exceed 35 years can apply for the post. The Corporation is hiring employees on the contract basis for 2 years. The interested candidates can contact Nepal Airlines Corporation, Human Resource Department for the application form. What Documents I Shall Submit? How to pay fee for the Application? The Candidates can get application from HR Department by paying Rs. 100 cash. How to Pay Exam Fee? The candidates who want to get job in Nepal Airlines Corporation shall deposit Rs. 500 in Nepal Bank Limited on the following name and Account number with all the documents and filled up form. The candidates who have deposited in the above mentioned name and account shall submit the original voucher and shall write Vacancy no. as 1/074/75, post: Junior Ground Equipment Operator and the applicants’ name and submit in the HR department within the office hours 11:00 to 4:00Pm. Deadline for the Application: 7 (Seven) days from the first publication of the notice.